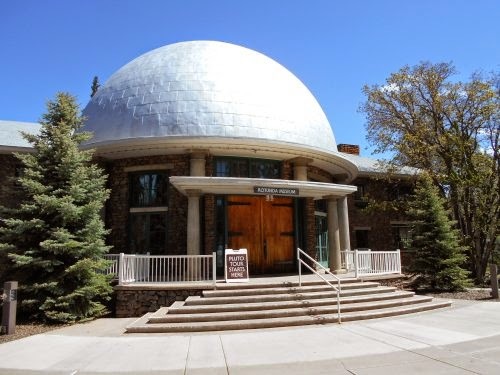 the Lowell Observatory. Note the lack of smoke this morning! 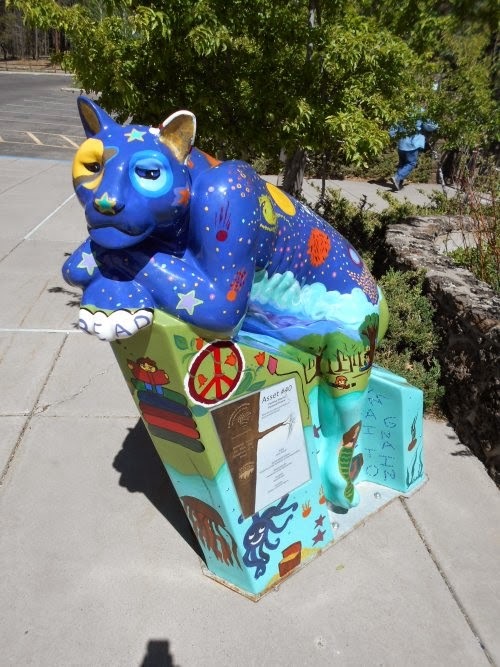 May 22: I was taking a day off of the trail! 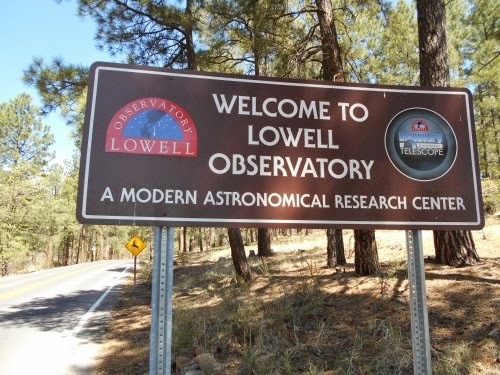 Besides the fact that I was still concerned I'd arrive at the Grand Canyon on Memorial Day weekend--an event that I very much wanted to avoid--there was a place in Flagstaff I've wanted to visit for years and by golly, now that I was in Flagstaff, I was going to visit it: the Lowell Observatory! After waking up in the morning, I headed out to the lobby for the continental breakfast which included waffles. Yumm... waffles.... I also ate a banana, and cereal, and yogurt, and pretty much one of everything they had available. What happened was that when they gave me the key card for the room, they put it in a little paper envelope, and when I left the room, I grabbed the envelope thinking that it was the key--or at least that the key was in it. It wasn't until I got back to the door of my room and I pulled out the envelope and saw it empty that I had realized--my key was in the room. I was locked out. I headed back to the lobby and explained my plight, and the desk clerk quickly made me a new key. The observatory wouldn't open for a few more hours so I had time to kill. I was in the habit of waking up at sunrise at this point. Even waking up a little before sunrise. 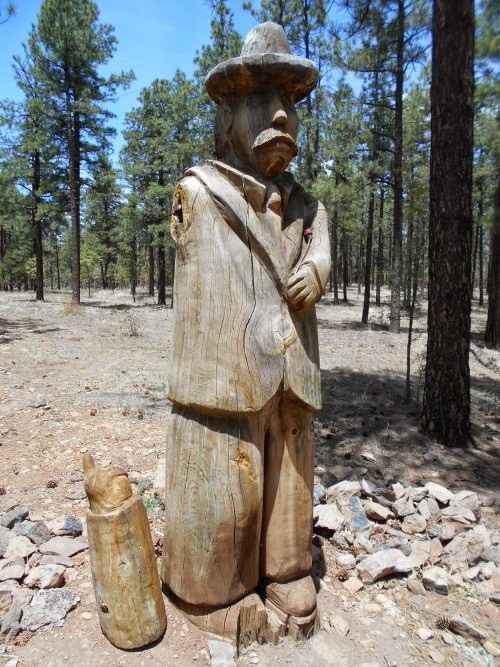 For the astronomers at the Lowell Observatory, they were probably just getting to bed. So to kill the time, I figured it was a good time to wash my clothes. The laundry facilities were in an adjacent building, so I carried my clothes out to there, but my key card wasn't getting me into the building. Argh! So I walked back to the lobby and the desk clerk wasn't sure what to do. He said he couldn't give me another person's key card (obviously), but that my card should have worked. I found one washer and one dryer in a cubby hole. For a hotel of this size, I would have expected at least a few of the machines, but neither of them were in use at the time so it didn't matter now. The machines took quarters, but I didn't see a change-making machine. Nor a machine to buy detergent to wash one's clothes with. Really? So I walked back to the lobby. "You're probably getting tired of seeing me," I told the desk clerk. "But I need quarters and soap for the laundry." Why he didn't think to tell me this before I tried to do laundry, I have no idea. Seemed like the logical head's up to give someone. "Oh, by the way, did you need to break some bills for quarters or need any detergent to do your laundry?" Instead, I had to come back and ask for it myself, but I got quarters--five dollars worth of them--minus the cost of the detergent. It was far more quarters than the washing machine required, but I figured I'd need the extra quarters when I road the bus into town. I headed back to the washer and finally got my laundry going and waited in a nearby chair reading Michael Connelly on my Kindle until it finished washing. I had no intention of drying my clothes. They'd air dry plenty quick since none of them were made of cotton. I surfed the web on my laptop a bit to kill additional time until it was time to leave for the observatory. 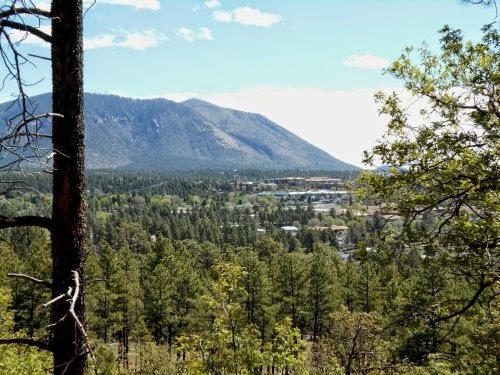 I walked to the nearest bus stop and hopped on several minutes later when the bus arrived to take me into downtown Flagstaff. From there, the observatory was about a mile outside of town on Mars Hill Road, but none of the bus routes headed up there. I'd have to walk it the rest of the way, but it was a mere mile away. Not a problem! The road up to the observatory had no shoulders to walk on, but only a couple of cars passed me. It wasn't a very busy road. At least not this early in the day it wasn't. The views as I approached the observatory were awesome, towering over the city. There was a haze in the air from the Slide Fire, but it was mostly clear of the thick smoke from the previous afternoon. The winds must have shifted away from the city during the night. At the observatory, I paid my entrance fee and proceeded into the theater where a video explained some of the stuff they were studying there. Afterwards, a tour guide showed up and led us around pointing out various features of the facility. Fascinated and fun, and I'll let the photos below tell that story. Almost immediately after that tour ended, the Pluto tour started. A lot more people had arrived at this point and the crowd size for this tour was more than double the previous one. Not a big deal, though. 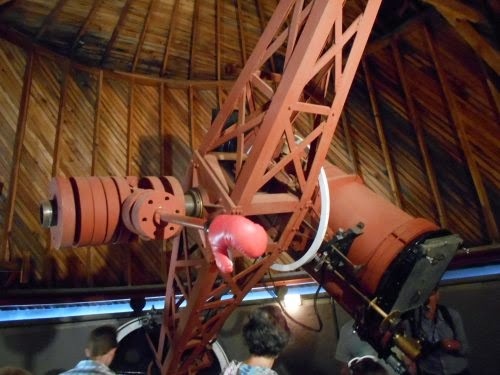 This tour was all about the discovery of Pluto by Clyde Tombaugh in 1930. 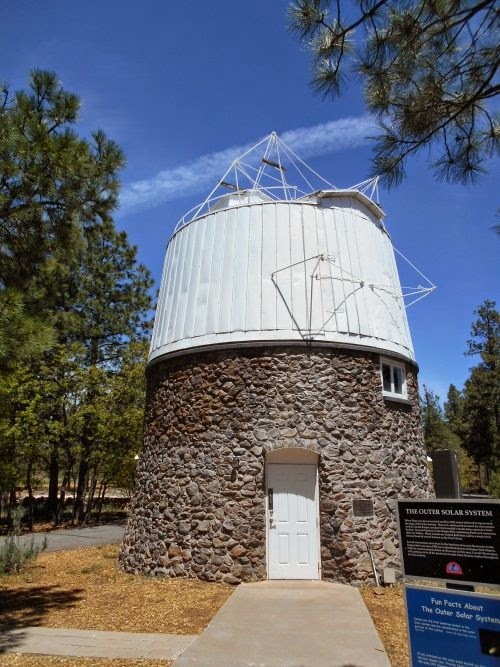 He had discovered the planet--and it was a planet at the time of its discovery!--using a telescope right there at the Lowell Observatory. 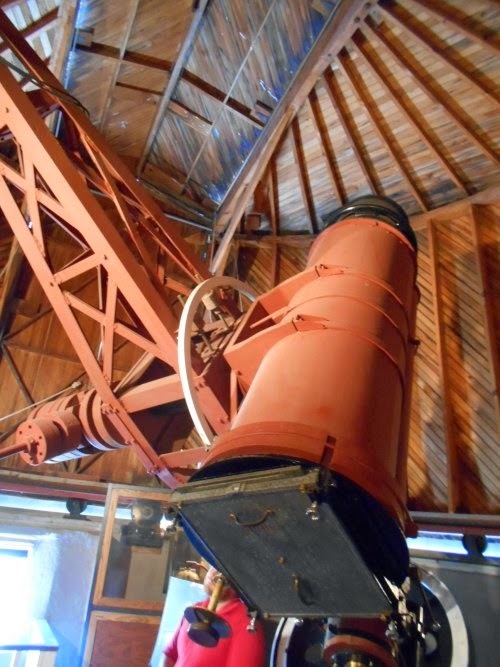 In fact, it's what the Lowell Observatory is most famous for. Our guide pointed out the building where Clyde Tombaugh had lived saying that it was still used as lodging even today--just as a man stepped out from the front door. "Is that him?" 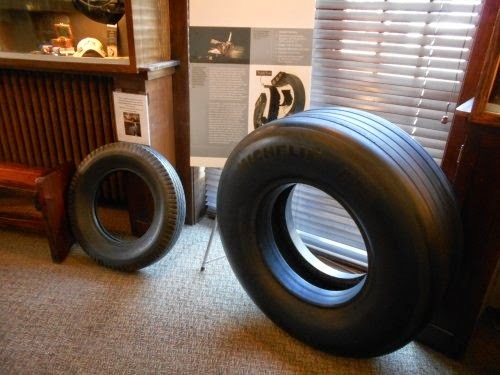 I asked the tour guide. "Is that Clyde?! Is it?! It is?!" He laughed but didn't answer the question knowing I was joking. A man who discovered Pluto 84 years ago probably wasn't living there anymore. He took us up to the telescope from which Pluto was discovered--which is no longer in use--and eventually the tour wound down to it's end. The Pluto tour starts at the sign in front of this building. And, as it turns out, they did have a Hydrogen-Alpha filter for their scope. Sweet! But when I looked through it, all I saw was a red disk and no solar flares or anything exciting. In fact, it didn't look much different than it did through my own telescope, except that the sun looked red instead of white. A big, red circle. I guess no solar flares were going at the time, and I was a little disappointed about that. By the time I left, hours later, school kids were everywhere. I could barely walk through the lobby it was so crowded with kids. Glad I got there as early as I did! The observatory is also open to the public at night where they will point their telescopes at cool stuff in the sky (Saturn and Mars were both prominent in the early evening), but I decided not to go back because late in the afternoon, clouds started rolling in not to mention all of the smoke in the sky. I didn't know if the night viewing would be canceled or not, but it seemed likely. 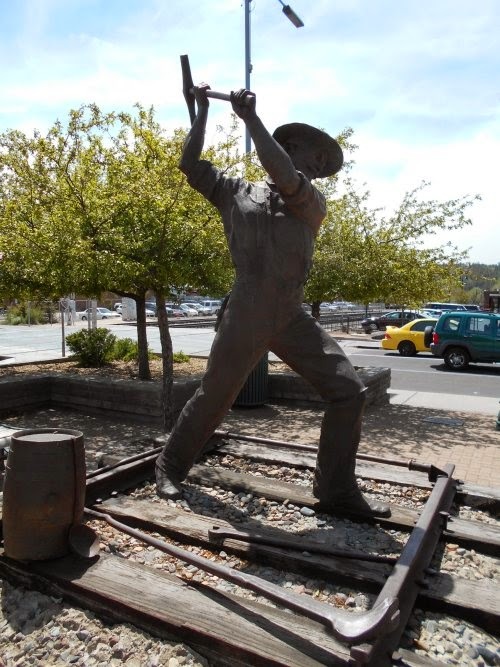 And since getting there involved a bus ride and a one-mile walk (one way! ), I decided not to even try. Not for an iffy shot at seeing some cool stuff through one of their telescopes! On a related note, I recently just read The Pluto Files: The Rise and Fall of America's Favorite Planet which is all about Pluto--from it's discovery in 1930 until it was demoted from being the ninth planet of the solar system to being the first dwarf planet of the solar system. The book is funny in a lot of places and the story is incredibly interesting. If you're at all a fan of Pluto, it's well worth a read! 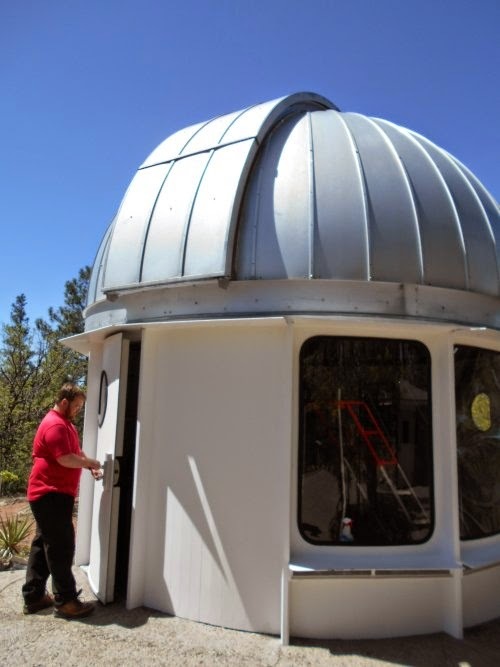 This observatory is where the Pluto telescope is located. The scope that discovered Pluto. This telescope doesn't have an eyepiece. 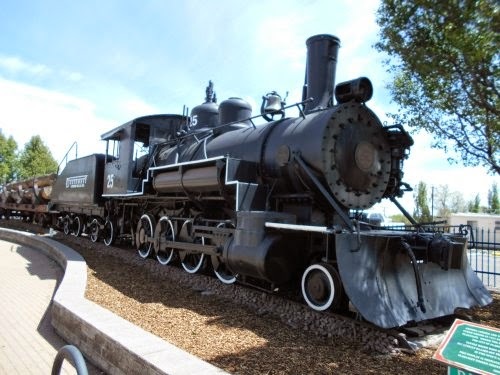 The back of it is designed to take photographic images for later study. 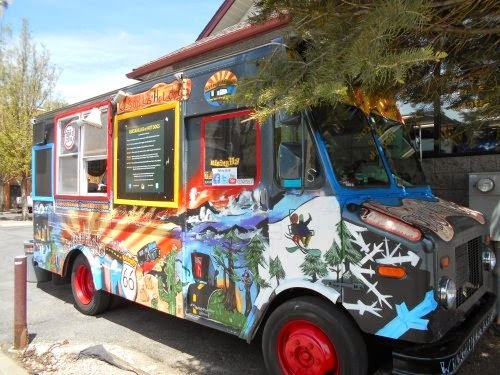 A food truck in downtown Flagstaff. 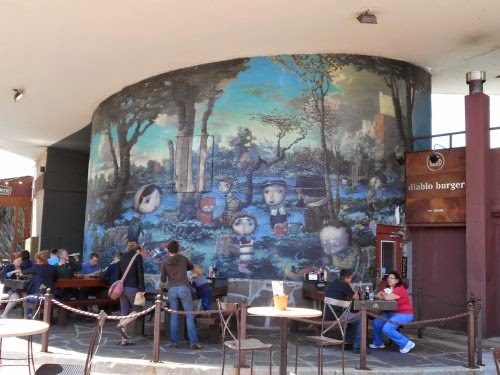 I really liked this mural at one of the restaurants in Flagstaff! Hold still! Just like that! Interesting side tour. Thanks for sharing.